Mr Johnson was diagnosed with non-Hodgkin's lymphoma in 2014. His lawyers said he regularly used a form of RangerPro while working at a school in Benicia, California. The implications of this verdict will be felt far beyond Monsanto's headquarters in Missouri. Glyphosate is the world's most common weedkiller and the science about its safety is still far from settled. In 2015 the International Agency for Research on Cancer, the World Health Organisation's cancer agency, concluded that it was "probably carcinogenic to humans". 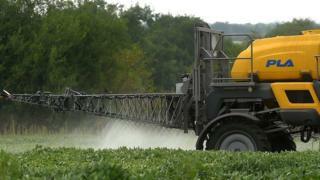 but the US Environmental Protection Agency (EPA) continues to insist that glyphosate is safe when used carefully. Jurors found on Friday that the company had acted with "malice" and that its weedkillers contributed "substantially" to Mr Johnson's terminal illness. "When you are right, it is really easy to win," he said, adding that the ruling was just "the tip of the spear" of future legal cases. In a statement after the ruling, Monsanto said it was "sympathetic to Mr Johnson and his family" but it would "continue to vigorously defend this product, which has a 40-year history of safe use".